A few months ago I was playing guitar at my church. We hadn’t had much time to rehearse that week, so things were still a bit loose. But he didn’t want us to play timidly out of fear of making a mistake. He wanted us to play confidently. I’d rather listen to music being played PASSIONATELY with a few mistakes than listen to “safe” music played by musicians who are afraid to mess up. How can you go “wrong and strong” in your studio? Maybe you can finally release that project you’ve been “tweaking” (i.e. procrastinating) for forever, even if it’s not perfect. What’s your “wrong and strong”? Maybe you need to sign up for Dueling Mixes and commit to finishing this month’s mix by the end of the month. That gives you 27 days to go wrong and strong. 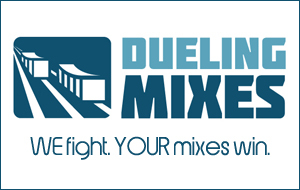 Whether or not Dueling Mixes is a right fit for you, find out what your “wrong and strong” is and GO DO THAT.